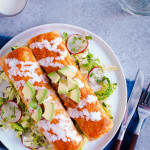 Shrimp enchiladas with slaw? Does that sound like a strange combination to you? It did to me until I tried it. I wouldn’t think twice about putting slaw together with shrimp tacos but for some reason slaw with shrimp enchiladas seemed odd. It reminded me of the Friends episode where Rachel was making Thanksgiving dessert and accidentally mixed the recipe for an English trifle with a recipe for shepherd’s pie. (Anyone else remember Friends or am I showing my age?) Granted a combination of slaw and shrimp enchiladas isn’t quite as crazy as Rachel’s creation but I really wasn’t sure how they would go together. It turns out they go together very nicely. It’s hard to describe but somehow the crisp and tangy flavors of the napa slaw complements the smokiness of the shrimp and chipotle sauce. It just works. The first time I made the napa slaw, I decided to leave out the radishes since no one in my family likes them. Although we liked the slaw, we felt like it was missing something. It turns out it was missing the radishes because the second time I made this recipe, I decided to give the radishes a chance and it made a huge difference. Even my kids liked the slaw better with the radishes. I’m not ready to start adding radishes to all my salads but they are a necessary part of this recipe. The source for this recipe comes from La Fonda restaurant in San Antonio, Texas where my husband’s grandparents lived for many years. It’s a restaurant that my husband’s family has many fond memories of – four generations of his family (including myself) have frequented it and we have loved everything we’ve ever had there. I think that is the main reason I wanted to try this recipe. I simplified parts of the recipe to make it easier and reduce the amount of pots and pans required. The original recipe called for oven roasting tomatoes for the sauce which I substituted with fire-roasted canned tomatoes. I also decided that straining the sauce wasn’t really required and just made for more dirty dishes. A thorough puréeing in the blender will make the sauce smooth enough. Also, be sure to use freshly grated cheese. Pre-grated cheese is often coated with something to keep the cheese from clumping together and will make the sauce grainy. Toss the napa cabbage, cilantro and radishes together. Cover and refrigerate. Whisk the olive oil and vinegar together. Add salt and black pepper to taste. Cover and refrigerate. Heat oil in a large sauté pan over medium heat. Add chopped onion and cook until translucent, 3 to 5 minutes. Add garlic and chipotle peppers and cook for 1 minute. Place onion mixture and tomatoes in a blender and purée until smooth. Pour sauce back into sauté pan. Heat sauce over medium-low heat. Add grated cheese a little at a time, stirring constantly until cheese is melted into sauce. Add salt to taste. Cover and keep warm. Coarsely chop the shrimp; set aside. Heat oil in a large heavy skillet over medium-high heat. Add the minced onion and sauté until translucent, 3 to 5 minutes. Add the shrimp and cook until opaque. Reduce heat to low. Add 1½ cups chipotle sauce (reserve remainder for topping) to the pan and stir gently until mixture is heated and shrimp are cooked through. Taste and adjust seasoning. Remove from heat, cover and keep warm. Whisk dressing until oil and vinegar are incorporated. Pour dressing over the napa slaw and toss to mix. Divide slaw among serving plates. Warm tortillas in the microwave until warm and pliable. Working with one tortilla at a time, gently dip tortilla in warm sauce on both sides and place on work surface. Place about ¼ cup shrimp filling on the lower third of the tortilla, roll, and place on top of the slaw, 2 enchiladas per serving. Repeat with remaining tortillas. When all the enchiladas are plated, top enchiladas with remaining chipotle sauce. Garnish with Crema Mexicana and diced avocado. Recipe adapted from the La Fonda restaurant via the Houston Chronicle. OMG!! I remember that exact episode!!! When the pages of the mag/cookbook were stuck together….I had to laugh! I probably would have done that!!! I must admit, I thought the combo sounded a bit unique but I trust your taste!!!! I haven’t ever actually had shrimp enchilada before – can you believe that??? Hmm, this might have to be my first ever!! I so miss Friends. What a great show! You’ve never had shrimp enchiladas?! They are definitely worth a try. I make a couple of variations – this one with a red sauce and another one with a white sauce. Both very different but so good.